Similar to many rivers in the UK, the River Severn under low flow conditions is artificially maintained through the conjunctive release of surface water and groundwater storage to balance the demands of abstractors with the ecological needs of the river. Prior to the 1980’s, regulation of flow within the River Severn lay solely with a large surface water storage reservoir located in mid Wales. Since the 1980’s further strategic water resource planning within the basin has focused on flow regulation through the phased development of groundwater storage via the Shropshire Groundwater Scheme. Originally conceived and promoted by the Severn Trent Water Authority, and now owned, operated and developed by the Midlands Region of the Environment Agency (EA), the Shropshire Groundwater Scheme (SGS) is the largest groundwater regulation scheme operating in the UK. SGS draws upon groundwater storage within the Permo-Triassic sandstone formations underlying much of North Shropshire. Groundwater is abstracted via boreholes, and discharged through a buried network of pipelines, either directly into the River Severn, or via one of its major tributaries. SGS is licensed for maximum possible abstraction of 330,000 cubic metres per day for river regulation purposes. To-date, four out of the eight designated phases have been built to realise a current deployable yield of up to 190,000 cubic metres per day from 40 abstraction boreholes. The fifth phase of the scheme is currently under development. SGS is specifically designed for short-term intermittent operational use of between two to fifteen weeks pumping per season, averaging two years out of every five. Operational experience of the Scheme between 1984 and 2009 has confirmed this assessment, with the Scheme being called upon in the summers of 1984, 1989, 1995, 1996 and 2006 to contribute groundwater support to river flows. Water is a heavy and expensive commodity to lift and the electrically-driven three-phase submersible pumps employed on the Scheme require large amounts of energy. In 2006, operational support from SGS contributed 4.7 million cubic metres to river regulation, incurring a total electricity bill of £67,000. This consumed 1.2 million kilo watt hours (kWh) of electricity and contributed 633 tonnes of carbon dioxide (CO2) emissions (calculated as 0.000523 tonne/ CO2/kWh, source: Carbon Trust). The high electrical demand of the Scheme means it has a large operational carbon footprint. The EA’s Internal Environmental Strategy (2007 – 2012) outlines its commitment to reduce CO2 emission from 2005/06 levels by 15% (8,400 tonnes) by March 2010 and by 30% (16,800 tonnes) by March 2012. Electricity used to pump water currently makes up almost a third of the Environment Agency’s emissions. 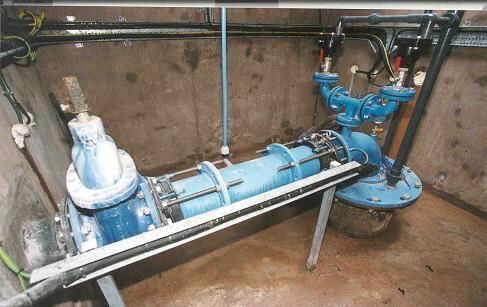 In order to help meet their targets, in spring 2009 Midlands Region of the EA undertook a project to assess potential energy efficiency savings, carbon emission reduction and reduced operating costs, through modification of the SGS Phase 1 groundwater pump control systems. During the course of the Phase 1 pump control panel replacement programme, an opportunity was identified to achieve energy savings and CO2 emission reductions by altering the way the pumps were operated through modification of the pump control system. 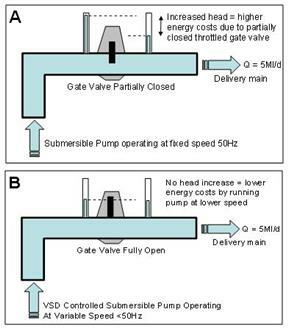 Potential savings were identified as the SGS pumps meet flow licence or operational conditions by operating as fixed-speed pumps, the yield of which are controlled by partially throttled valves. 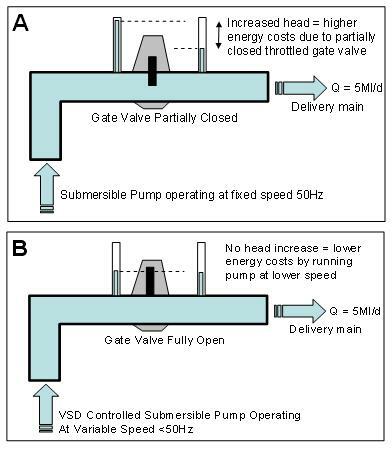 This method is an inefficient way of controlling flow as the physical restriction causes increased head loss across the partially closed delivery valve. This is compensated for by making the pump work harder, thus drawing more energy. By employing Variable Speed Drives (VSD) to control the pump, energy consumption was reduced by fully opening the throttled delivery valve, thus removing the physical energy sapping restriction. The operating speed of the pump could then be reduced to match the previously throttled flow. This “electronic throttling” reduces head and power consumption by the pump but still maintains the same delivery yield. By reducing the power required to run each pump, CO2 emission savings could be achieved through reduced energy consumption. By modifying the control panels on seven pump units making up Phase 1, the collective daily energy saved was over 990 kWh. To put this in to context, these savings alone would provide enough energy to run one of the local area offices for the day. Not only do the improvements mean that these pumps are now much more reliable, the pumping costs are also reduced by £85 per day. This in turn reduces the equivalent carbon dioxide emission by 0.5 tonne per day. Measured energy savings and emission reductions for the seven pumps making up Phase 1 are shown in the table below. This project, although initiated as a result of a requirement to upgrade outdated equipment, demonstrates how adoption of innovative technology has enabled the EA to enhance the operational reliability of the Phase 1 area of SGS while ensuring it minimises its CO2 emissions and reduces running costs. Based on the encouraging results of this trial an assessment of the remaining 29 pumps making up Phases 2, 3 and 4 is currently underway. Midlands Region, West Area Groundwater & Contaminated Land Team, Environment Agency, Hafren House, Welshpool Road, Shrewsbury, SY3 8BB. Midlands Region, Environment Agency, Sentinel House, 9 Wellington Crescent, Fradley Park, Lichfield, Staffs. WS13 8RR.